As of yesterday (boy, I wish I’d had the energy to post this yesterday! ), Jim and I have been married for exactly a month. I wish I had more to reflect on. In many ways it’s been the same as before the ring. We’ve lived together for almost two years, so most of the day-to-day stuff is just the same. Not to mention, we were on our honeymoon for half of that month, which was of course, amazing as heck. whatever that means. I want to have dinner ready when he comes home from work late and I want to be able to do the laundry and vacuum the floors and keep the place tidy. The unfortunate part about that is that I just don’t have the energy for it. Period. I try. I really do. And most of the time, I can do most of it. But lately I’ve been feeling worse than normal. I’m actually waiting for a call back from the doctor’s office so I can get in and have some tests done. It’s just not normal. 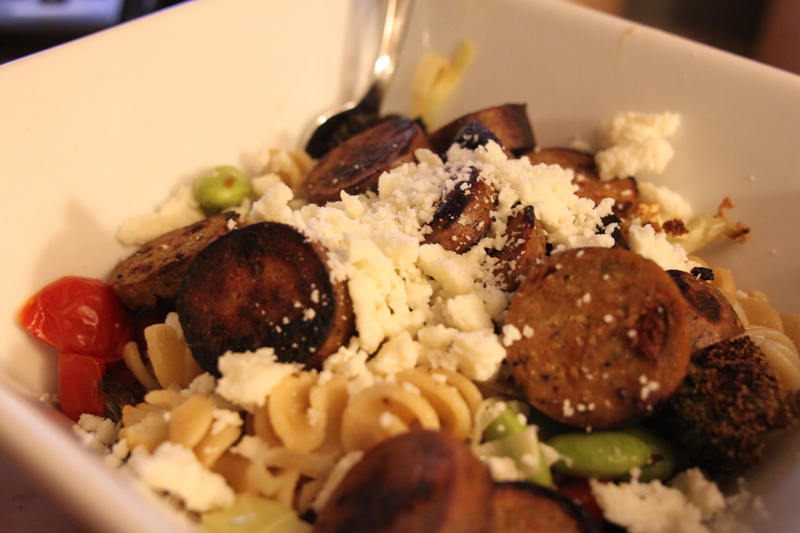 On to a happier note, I made a delicious “compromise” pasta dish last night. And some brownies that we won’t talk about (I tried a “healthy” recipe and got a piece of chocolate flavored rubber that was made edible only by the application of a big glop of Nutella). But enough of that, on to the good stuff! Toss broccoli and cauliflower with a little bit of olive oil, garlic, salt and pepper and cook on a baking sheet for about 25 minutes or until the veggies start to turn brown. Meanwhile, boil up a pot of salted water for the pasta. Cook pasta until desired tenderness. Some people like al dente, I do not. Tis up to you. Drain the pasta, saving about 1/3 cup of the water for your sauce. In a large (and I really do mean large, we’re going to add the pasta to this thing) frying pan, heat enough oil to saute the leeks and garlic. 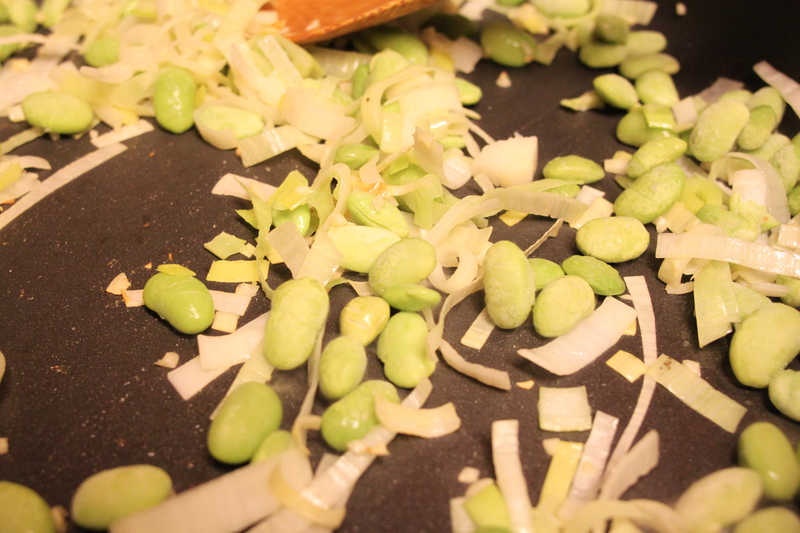 When the leeks have become softish (about 1-2 mins), add the frozen edamame and cook for another approx. 2 mins. At this point, put your sausage slices in another small frying pan with a little bit of olive oil. I like mine with a bit of brown around the edges. You may just like yours warm and still a bit softer. It should take 2-3 mins either way. Next add the butter to the leeks and edamame. When the butter has melted, add the pasta water and the white wine. 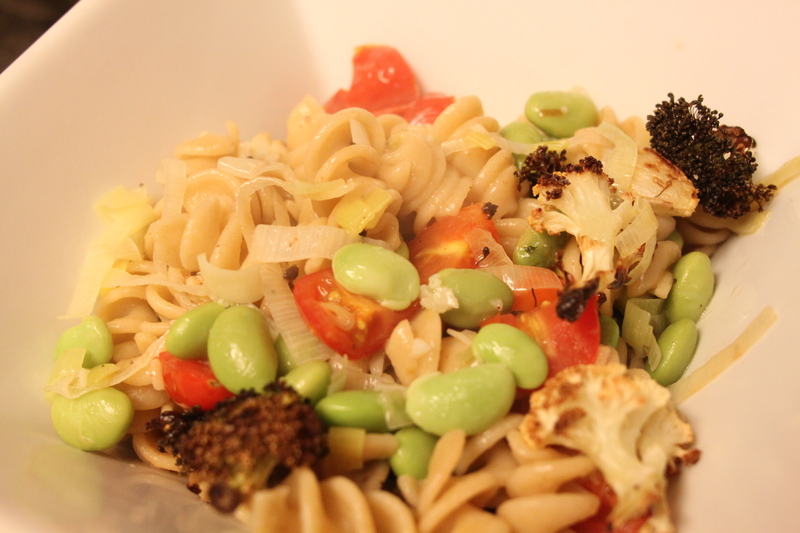 Give that about a minute and then add the drained pasta, cherry tomatoes and the roasted veggies. Give it all a nice toss and plop a portion into a bowl. Lastly, add the sausage to the top (if you mix it in, it looses that crispy that I like) and sprinkle with the queso seco. This is another fun “compromise” dish because Jim happens to love that sausage as much as I do. It’s funny to think about how much veggie stuff he eats now. When I met him, he was like “what? you want me to eat that? where’s the meat? !” Now he’s pretty much up for anything. And you know what I love most? He tells me when he doesn’t like something. Like these meatless meatballs I got from Trader Joes. I happen to think they’re pretty tasty, but he dislike them quite a bit. Tonight I believe we’re having salmon burgers with sweet potato fries. What’s on the menu for dinner at your house?